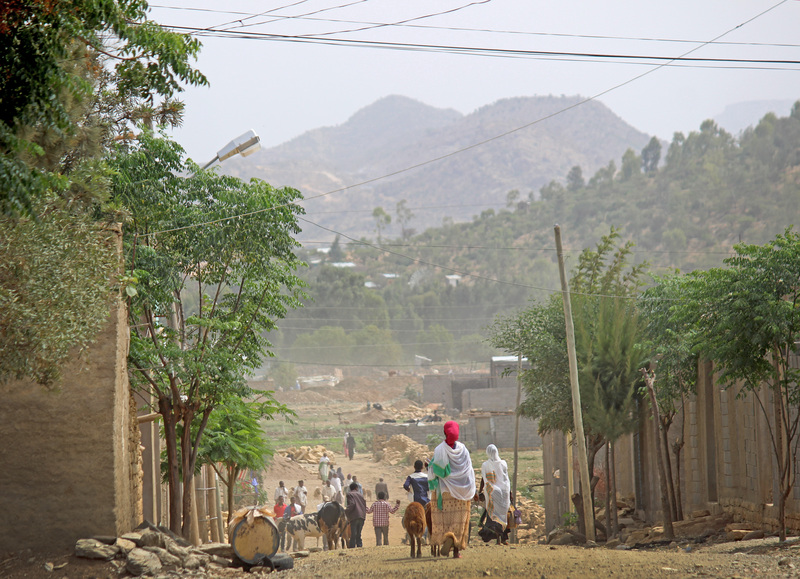 Wukro is a small, yet rapidly growing town in Tigray region, Northern Ethiopia, and the location for REACH’s observatory on ‘Small town pathways to water security’. Despite its good connectivity with Mekelle, one of Ethiopia’s biggest cities, the town appears like an island amidst the desert in May, the hottest month of the year. In a blog post dated from September 2016, Dr Katrina Charles notes Wukro’s transformation from a dry, vegetation-bare landscape during the dry season (February 2016), to one filled with lush green healthy crops and a flowing river a few months later, following the wet season. During my visit, it seemed that the town had been barely touched by rain, with its brown, rocky soils stretching as far as my eyes could see. It is a town of contrasting appearances. On the one hand, it can seem quiet, with its three-wheeled bhajaj, carts pulled by animals and just a few cars. Yet, the town is also rapidly developing, accommodating many hotels that are occupied by NGO workers and occasional local tourists. The construction is booming, however currently without active work going on, storehouses look abandoned and scarily empty. Intensive building construction is an ongoing phenomenon in urban Ethiopia that has set ambitious targets to transform its cities. How does water provision follow this growth? To a large extent, it is supported by UNICEF ONEWASH plus programme, funded by DFID and aimed at improving water security, mainly through the development and utilisation of a new source in Abreha Atsbeha and the replacement of old pipes. The project started operating just a couple of weeks before my visit, so I had the opportunity to hear how people perceived the changes brought on by the project. I was accompanied by a team of researchers from Mekelle University who recently started research under the REACH Exploring Inequalities Grants and were starting their week-long scoping visit in Wukro. We heard many stories during this week: filled with satisfaction from the promising start of the project and with continuous water related hardships. These were nuanced and complex stories that are often unaccounted in quantitative studies and evaluation projects. Drawing from this short visit, I critically review some of the challenges to providing affordable and equitable water access. Throughout our multiple visits to the water utility, we learned that the town is segregated into geographic zones, some of which get water provided daily, others weekly. The water utility tries to provide free drinking water to the places facing acute shortages. Yet, still people need to learn how to navigate this environmental injustice. In many places you assume that the haves will share or trade water with have nots. However, here the law prohibits any trade of tap water, so they do so quietly, most often at night. We discovered that water is supplied upon provision of a land certificate – but what happens with the tenants? There is the assumption, in the water utility office, that landowners are responsible for providing houses with a water tap. However, the price difference between properties with and those without a water tap is so large that people prefer to manage water by themselves, accessing it from private companies, or illegal vendors. Frequently, tenants are young women who migrate from neighbouring villages with an aspiration for independence and improvement of their socio-economic status through opening a small enterprise such as the brewing of local beer. Securing water significantly adds to the difficulties they experience in their daily lives. 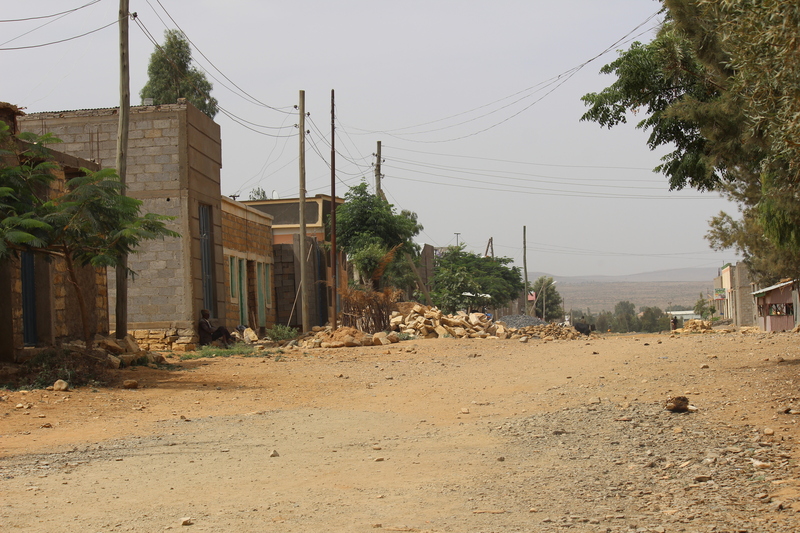 In general, the town residents we approached considered water in Wukro to be cheap – with prices ranging from 0.5 to 1 Birr (0.03 GBP) per jerrycan (25 L). Nevertheless, affordability is still a challenge for the most vulnerable. We met people, old, single and disabled, without access to social care, thus often having to compromise water with food, trading between two essential needs. And even though a water tap is just across the road, people with mobility impairments are dependent on begging passers-by for their mercy to carry a jerrycan. For others, the cost of transport for carrying the collected water is usually higher than that of water itself, which significantly adds to the overall water expenditure. One of our respondents claimed to spend around 17% of his income on water expenditure (mostly due to the cost of transport), which is far above the affordability threshold of 3% suggested by the United Nations Development Programme. The river is a free source of water. However, it is to a large extent exclusionary: only those who are better off can afford collecting water from the river because of the need for transportation, which is generally undertaken by donkeys. Besides, in terms of washing, only men who are culturally permitted to can wash themselves in the river. Piped water is provided to Wukro town residents, but the town has already outgrown its boundary. The periphery, for which the responsibility of providing water falls outside the town jurisdiction, has been a grey zone for some decades. People living in those grey areas are either still collecting water from a joint waterpoint or try to organise themselves to buy and trade illegal water. The joint waterpoint is not far, and we walked to it joining a conversation between two single mothers. They were vibrantly chatting to each other, one of them carrying a boy (2-3 year old). At the busy waterpoint these women filled their jerrycans. The son of one of them started crying, demanding to be carried. The woman shouted at him: But who will carry the jerrycan? Will it have feet to walk by itself? The boy continued pulling her clothes. 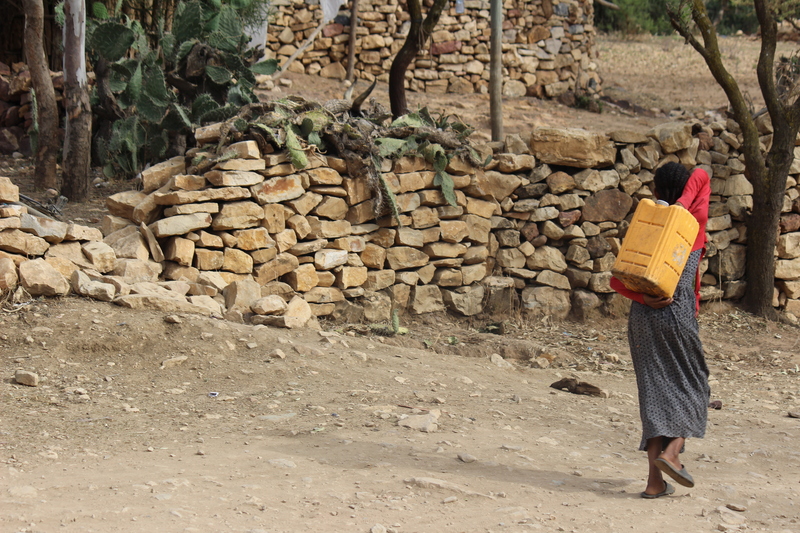 She complied: placed her jerrycan on her back (25 kg) attaching it on straps and placed the boy (12-16 kg) on her hip, commencing a walk up the hill towards her home, unfortunately located outside the piped water zone. I have now returned to the UK, but the team will continue to engage, explore and reflect on the water related inequalities unfolding in Wukro to help future programmes more explicitly design for these groups. I look forward to hearing more about the qualitative in-depth study they are just about to start!